Regular readers of my blog have probably noticed that I use Google Sheets for almost everything. I use it to track the live net asset values of various companies, I built my valuation models in Google Sheets and everything is tied together in a master portfolio sheet (some if its functionality you can glimpse from my performance review posts) . 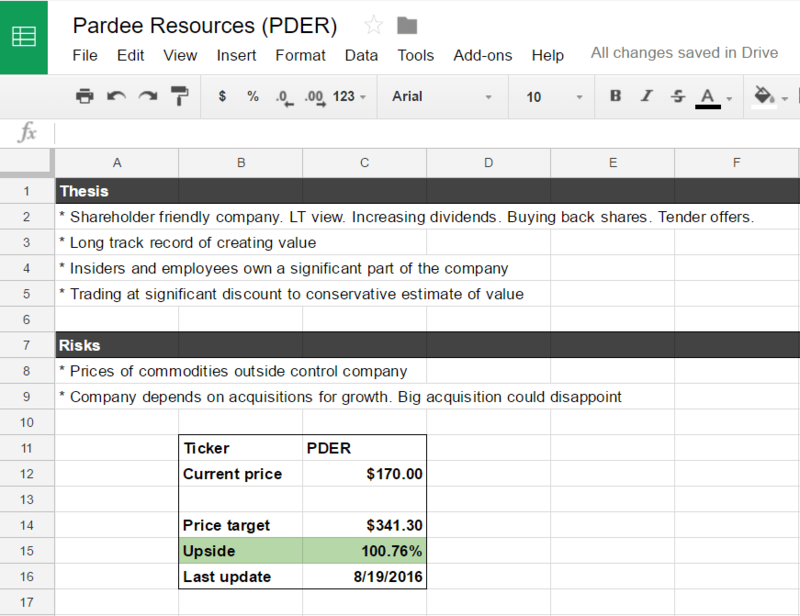 A few years ago I wrote a short tutorial that explained how you can add realtime price information in Google Sheets for stocks that aren’t support by the standaard =GoogleFinance() function. After entering this function in a cell you initially get an error message. Hover with the mouse cursor above the error message, and you will see that a small pop-up that asks if you want to give your sheet access to the other sheet. Do this, and the data will appear :). Combined with the option to get realtime prices (as discussed in my old tutorial) you have an incredible toolset to make a fancy spreadsheet. Not only will this give a quick overview of which positions are perhaps becoming more or less attractive, it’s also easy to build a watchlist like this (I have done this as well). Everything that you researched, but didn’t buy can be put in that list together with positions that you have sold in the past. One limitation to keep in mind is that Google isn’t happy if one sheet requires to much calls to outside sources, and by making one sheet dependent on tons of other sheets the number of calls can explode quickly. So you will have to try to not invoke to many =ImportHTML() and =ImportXML() functions in all the combined sheets in order not to break things. This entry was posted in General on April 8, 2017 by Alpha Vulture. Did you have a background in this stuff? I’ve tried to figure out the import xml thing but I started to feel like I was going to have to become a programmer to understand it. I have sometimes been able to get it to work by trial and error and looking at what other people have done but I don’t really understand it, and usually they change something about the page later on and the reference quits working (I’m guessing that’s what is going on) at which point I am lost. My computer skill level is probably fairly low though. I am software dev myself, wondering if a “GitHub for Investing” would be a useful tool. I don’t really have experience with GitHub, so can’t comment if it would be a useful tool. How do you update RHDGF, google finance doesn’t list the subsidiaries on it’s platform. I have a very similar setup. Yes, got inspired by your Google Sheets use long ago, but funny to see how much it converged. How do you take care of the sorting on position size? The sorting function seems to break any dependent cells on the same or other sheets. Of course this can be settled by reorganizing the data or using a separate presentation sheet, but it’d rather avoid that. I put everything in the same workbook, but I have the impression it gets slower the more sheets I add to the deck. The random behavior on errors with ImportHTML and ImportXML are also not ideal. But it’s not as if there’s a real alternative. I have no problems with the sorting function. In the sheet pictured in the post every company has one line, and if the data isn’t entered there directly it’s coming from a different sheet. Very helpful! How do you track spreads or hedges? Secondary question, how do you track dividends paid out? I have a nice sheet the tracks spreads. Mostly a lot of manual work, but of course with real time prices. And I don’t track dividends paid out. What does the blue represent in the look through sheet? Thanks for sharing. I also use Google sheets to track investments, do you know if it’s possible to set up an alert which would be triggered by a cell’s criteria, which would run periodically in the background i.e. Google finance update the data in the spreadsheet without a user actually opening the document? Simple example: Cell has an IF formula to show true if stock price exceeds X, when shows true an alert should be sent. I’ve tried to research this, and have found some attempts at stock alerts, but haven’t had much success. I think this would be really useful, but not sure if possible, particularly as it needs Google finance data to refresh in the background i.e. without a user opening the document. It’s probably possible, but would require to use Google Apps Script to program it. I set it to send an email, as haven’t signed up to Twilio yet, but it works great if you’re interested.